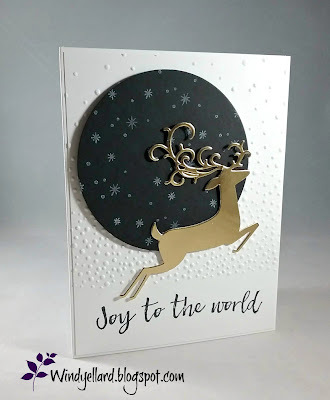 Sending this card out to a friend in need today. 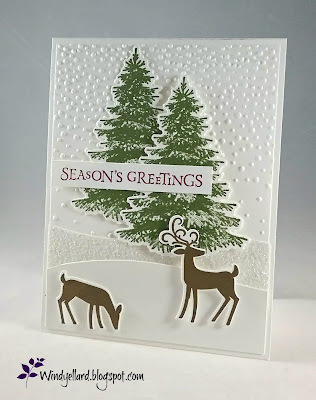 especially with the embossed background! and one for the middle lined image in Heather. Beautiful Layers thinlits dies. The leaves are in Granny Apple Green. Beautiful Promenade on a white strip in Grape. 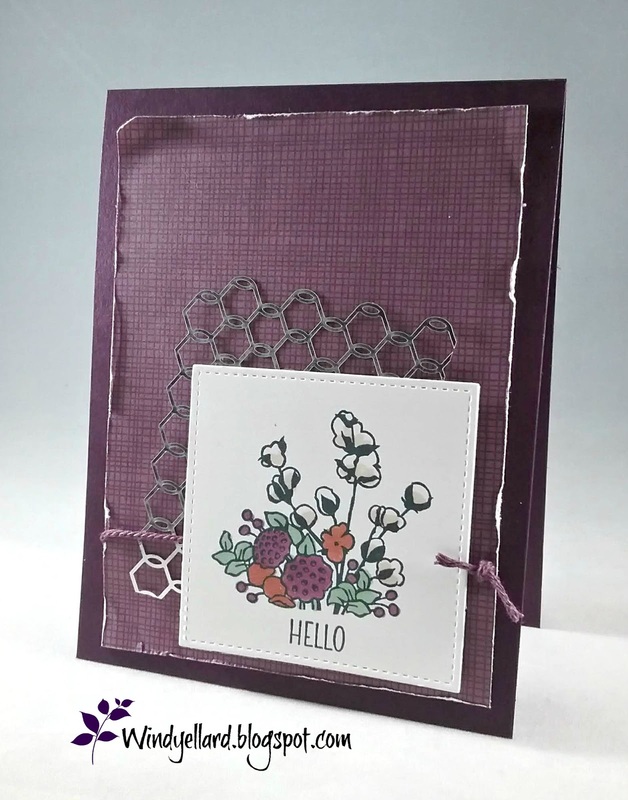 with the Tufted embossing folder. 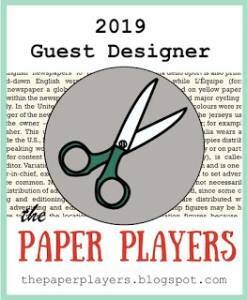 designer paper...."need to use paper" keeps ringing in my head! I tend to hoard paper and then have much left when it retires. with my fingernail. 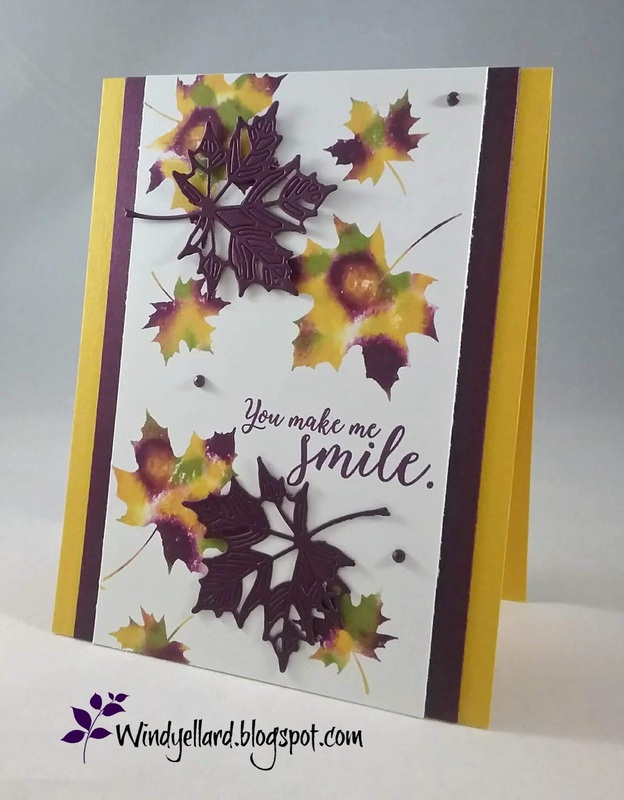 I layered it on a Blackberry Bliss card base. to finish it off. Will be sending this off to my mom this week. Here is the other card I made with the clear E block inked in Gray Granite. 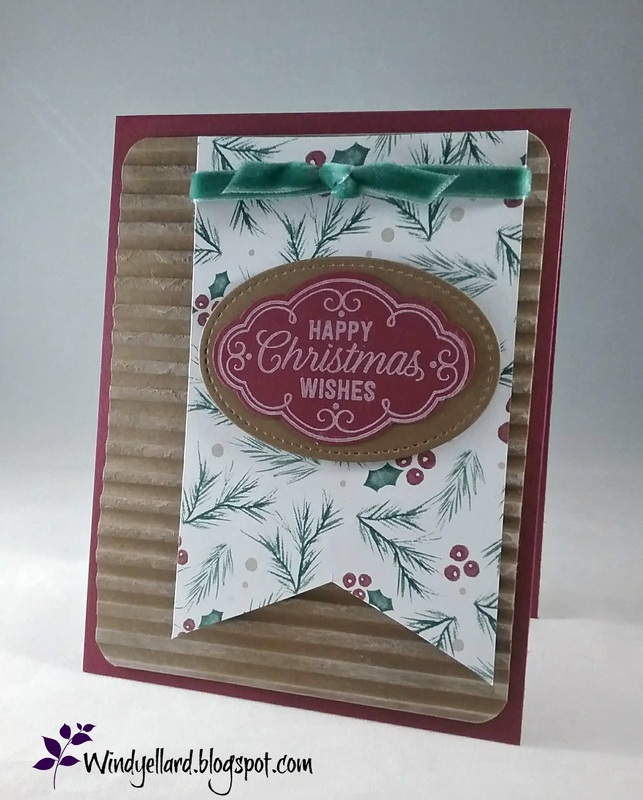 made two separate cards. The inked block went straight to paper. I cut the all the trees and the snow hill from the Into the Woods dies. There are two trees layered together. The solid tree and the detailed tree. 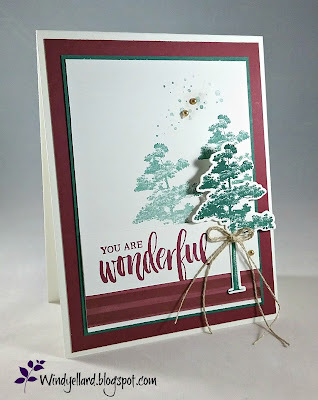 I stamped the sentiment from Christmas Pines in Early Espresso ink. 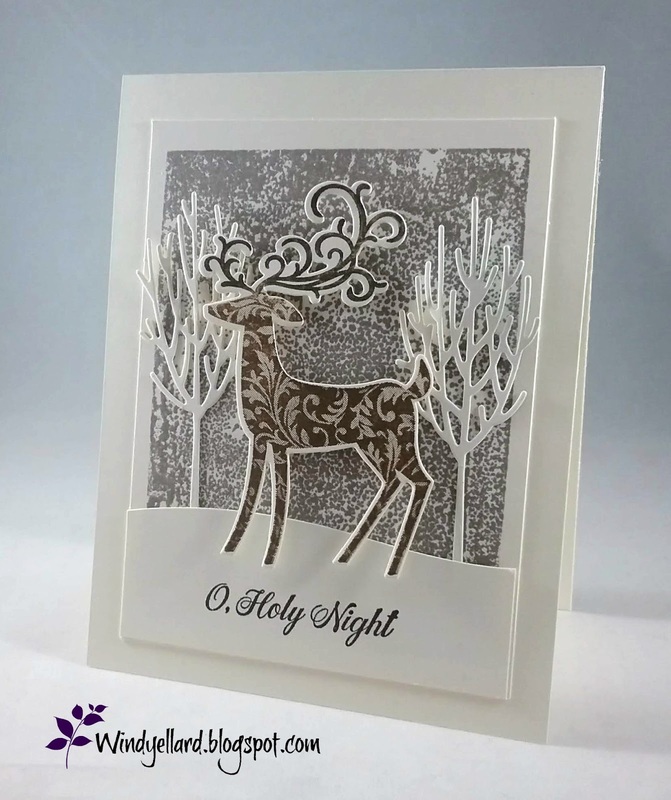 please look back to Sunday Oct. 28th for Holy Night Deer. Hope you enjoy your Monday and thanks for stopping by! my clear block and possibly make a winter scene. I had no idea it would turn out so amazing! 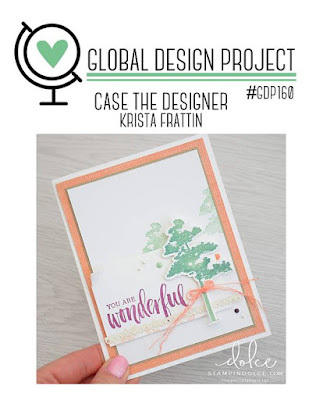 and "stamped" it right down on a piece of Very Vanilla card stock. in Soft Suede for the body and Early Espresso for the antlers. I cut him with the Detailed Deer dies. I stamped the sentiment from Illuminated Christmas in Espresso. I layered it on a Very Vanilla base. Check back tomorrow for a scene like this but with a snowy tree! I stamped the sentiment from Beautiful Blizzard set in Poppy Parade. I layered it all on a piece of Poppy and then a Vanilla base. and colored all the leaves and berries in the Stampin Blends markers. I used Poppy Parade and Shaded Spruce markers. that I colored with the Mango Melody Stampin Blend marker. Tide then cut them with matching dies. 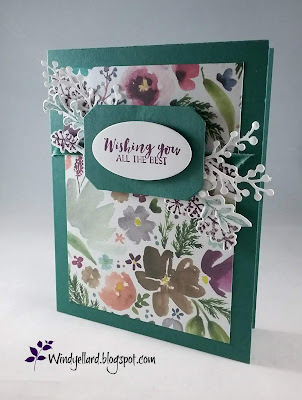 I stamped the long floral pieces in Tide and added those, too. I used the same die set to cut some white pieces. from the same Frosted Bouquet dies. I will probably use it for a birthday card. die set and this was the perfect time to pull it out. the Beautiful Blizzard stamp on Very Vanilla. then Pumpkin Pie and finally a Very Vanilla base. 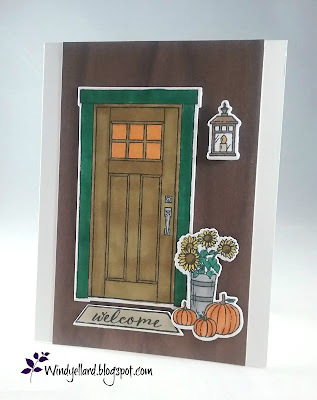 and added a Pumpkin pie enamel dot to finished it. 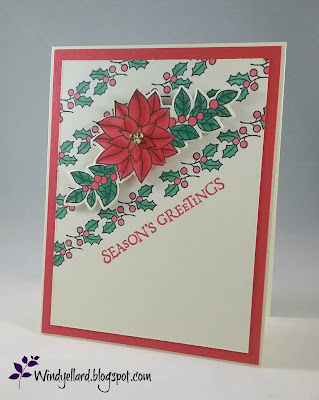 This one is on the way to my mom- she gets a card each week! card but decided to go another route so you get to see it now! DSP on with that pretty copper foil leaves on it. plus the Merlot scallop oval behind. Love the host set called Hung With Care! Mostly love the dutch shoes with the bow! I thought of this set as soon as I saw this sketch. 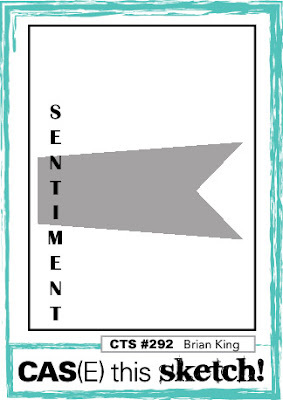 sentiment across in Real Red ink. stamps with different color markers. around with a bow. The top almost looks like a present! and then that made me think of the deer plus snowy hills. 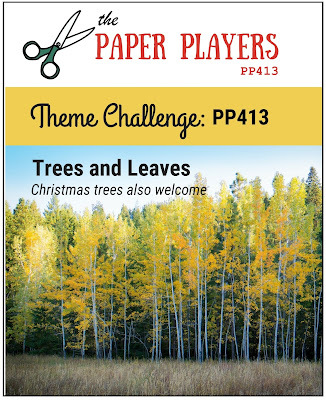 paper from Into The Woods dies. from Detailed Deer thinlits dies. and placing all on a white base. Have a lovey day and thanks for stopping by! to look more fall or winter like. 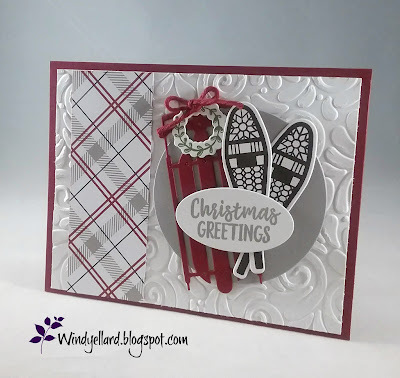 twice on the background- both times stamping off to make them lighter. the same color from the Timeless texture set. I cut a strip of white and stamped the sentiment in Merry Merlot. I added some Joyous Noel DSP with the stripe print beneath. Merlot before adding to a white base. I finished it off with some gold pearls and a linen thread bow. 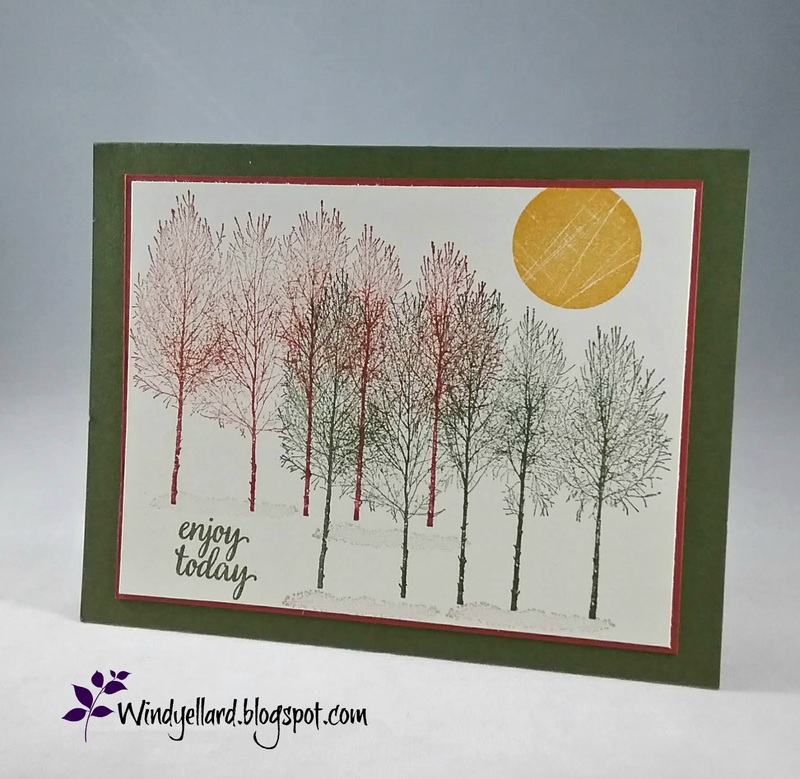 thought trees from Winter Woods set would give it depth and texture, too. north (I am hanging in 90 degrees Florida with no sign of fall). Each row of trees were a different fall color. I stamped the Cajun Craze set first and the n the Mossy Meadow. I stamped the harvest moon in Crushed Curry from the Wood Woods set. I added the sentiment from Eastern Beauty in Mossy. I also stamped some ground in Sahara Sand beneath the trees. base. Simple but sweet. It is headed out to my mom today! She is in Atlanta so maybe a little more cooler than me! I looked long and hard at each of my sets. 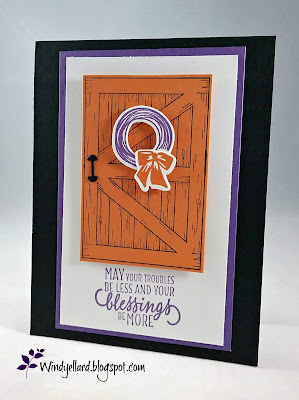 When I saw my Barn Door set, I thought an orange barn door...yes! 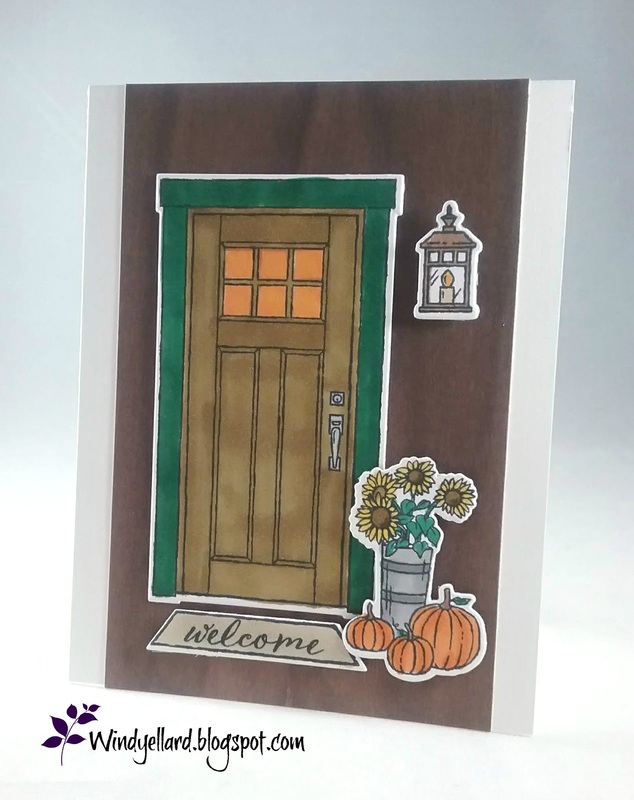 I stamped the door on Pumpkin Pie card stock in Memento Tuxedo Black. and then cut the bow out with the die for it. I layered the Pie bow on the wreath over the Grape one. I cut the little handle in black card stock with die also. it on a Basic Black base to finish it off. 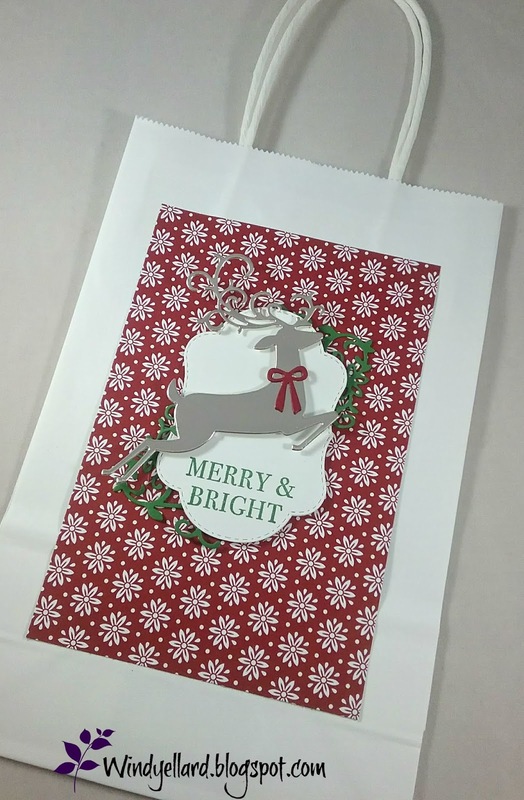 something they can carry their handmade cards home. theme so they can use them again. I layered some Dashing Long DSP cut 4" by 6". from Hearts Come Home set in Garden Green ink. Cherry Cobbler bow from the Alpine Sports dies to him. 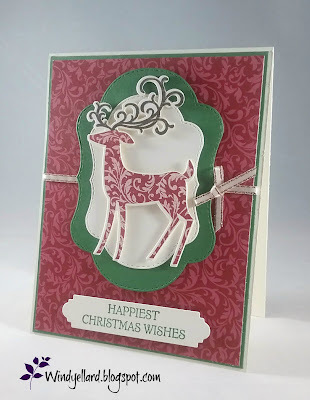 I added some greenery on both sides from the same Detailed Deer dies. Quick and easy for the holidays! Hope you have a blessed Wednesday and thanks for stopping by! I love the background you can make with this Beautiful Blizzard set. So when I saw this sketch, I knew what to do. after stamping off to make it lighter. with the Bermuda Bay dark Stampin Blends marker. Adding it to the Bermuda bay base was the finishing touch. 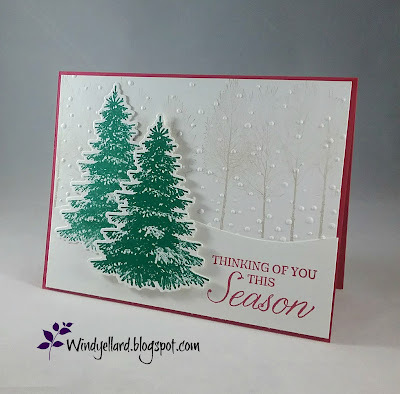 I made a sweet winter scene for my last Christmas card for classes this week. on a piece of Whisper White card stock. I ran it through the Big Shot with the Softly Falling embossing folder. 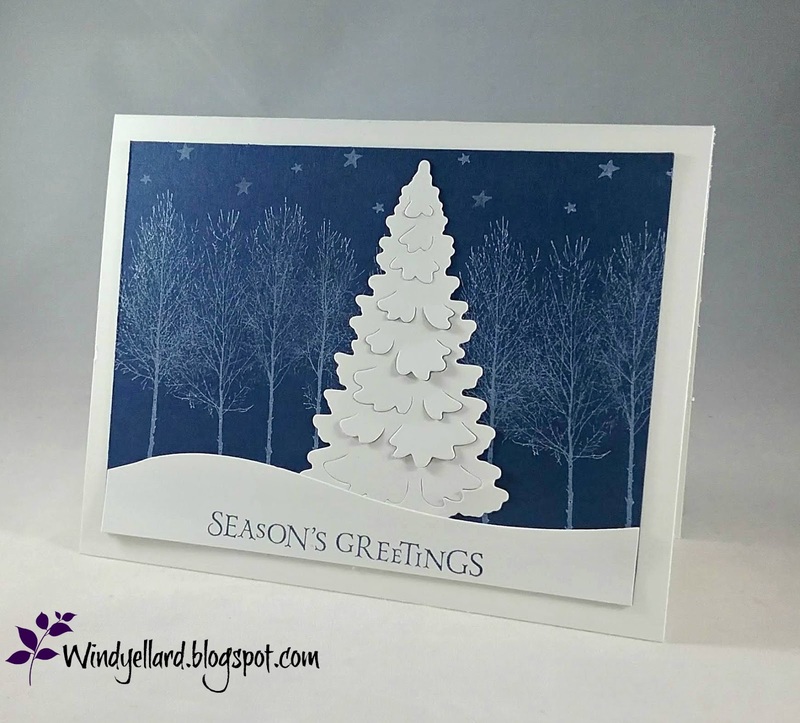 I cut the snow hill in White card stock with the Into The Woods dies. I stamped the sentiment in Real Red. the second one behind is stamped off once to make lighter. They are cut with the matching dies. The Alpine Adventures bundle is so much fun. the Swirls & Curls embossing folder. I layered it on a Cherry Cobbler base. to the side and a Gray Granite circle to the other side. in Early Espresso and the wreath in Mossy Meadow ink. All cut with the matching dies called Alpine Sports thinslits dies. white oval and finished it off with a Cherry twine bow on my wreath. Hope you have a blessed Sunday ans thanks for stopping by! 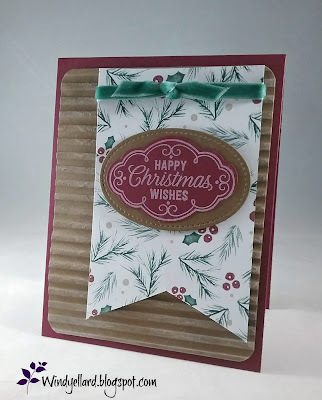 making this third card for Christmas Classes this month so awesome! Memento Tuxedo Black on the thick White stitched square. I used my Stampin Blends to color the wise men. on the Smoky Slate banner. 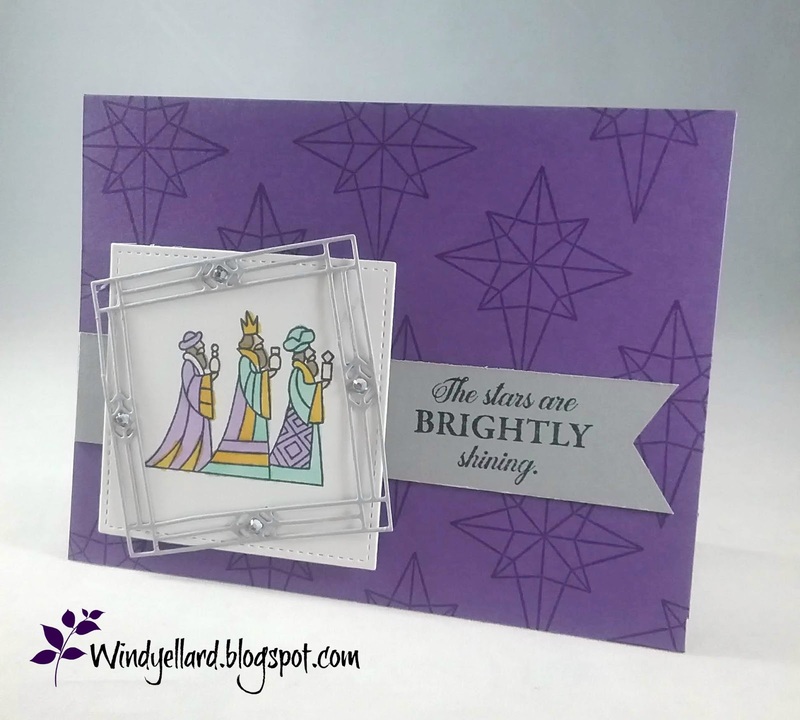 in Smoky Slate card stock and added some bling with rhinestones. 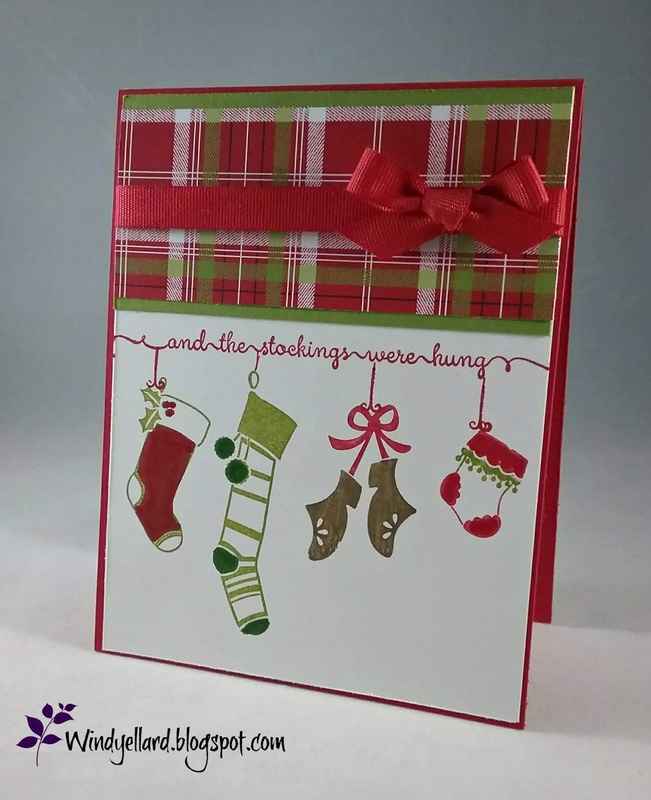 for the layout from the holiday catty page 15.
and used it on this second card for classes. tying some ribbon around with a bow. 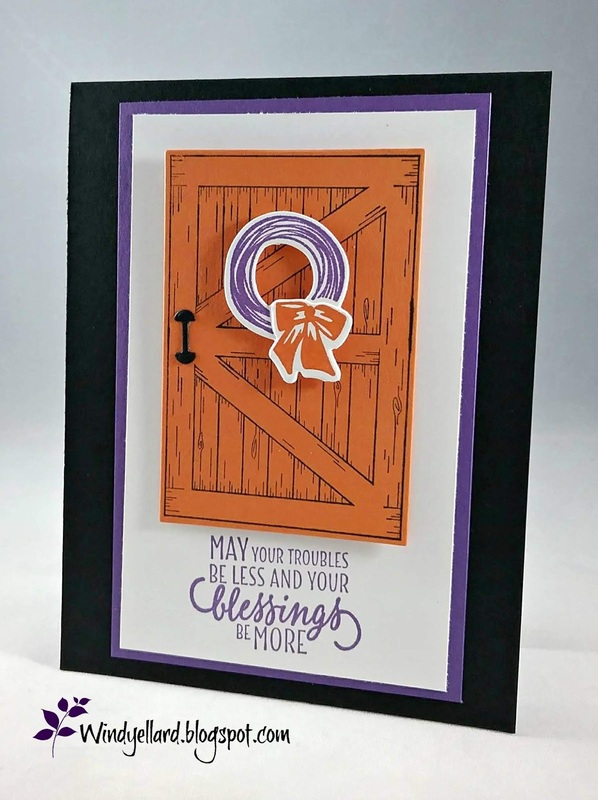 cut with the Stitched Seasons dies. used a Early Espresso marker for the antlers. It was cut with the matching die set called Detailed Deer. for the sentiment stamped in Garden Green on Vanilla. 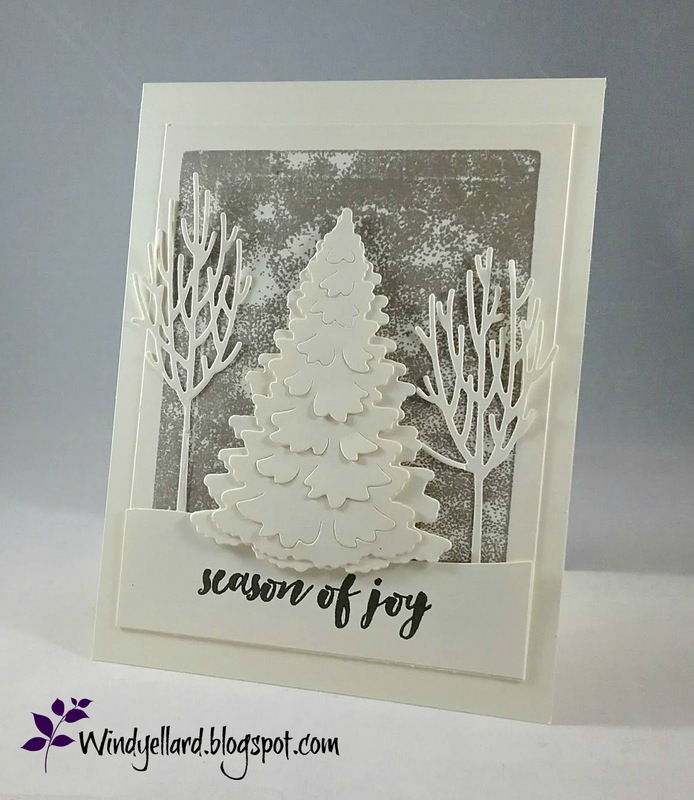 My first class card for Christmas card classes this month. I love the Beautiful Blizzard bundle and so easy to use. 5 times with the larger background stamp in the set. 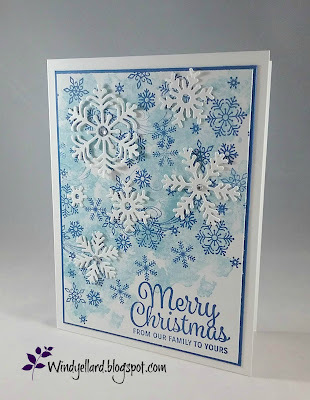 I then stamped over it in Blueberry Bushel ink with the snowflakes stamp. 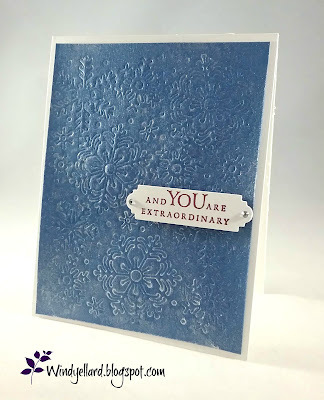 I stamped the sentiment in Blueberry Bushel from Snowflake Sentiments set. 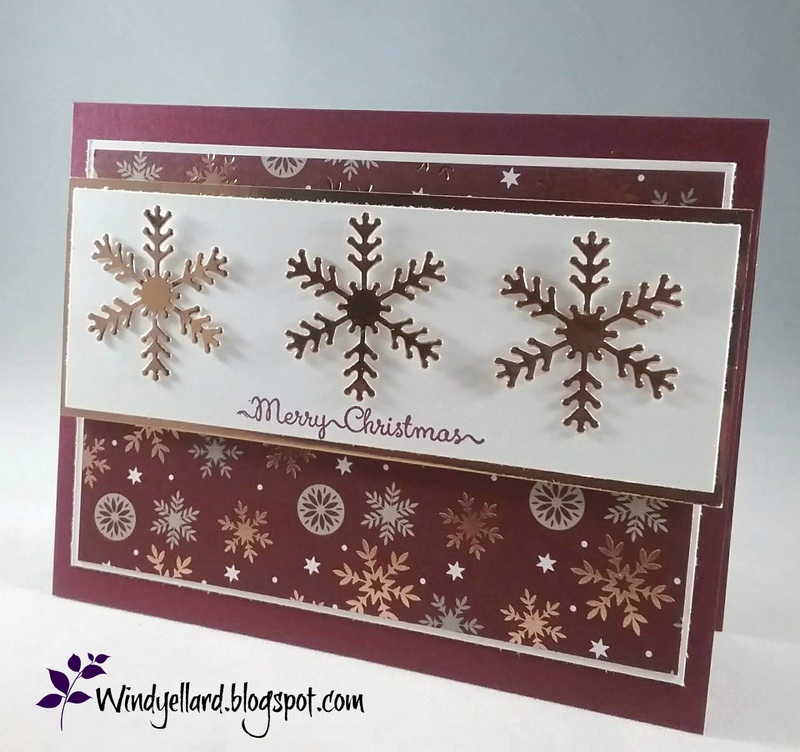 I then cut the white snowflakes with the Blizzard thinlits die. I added some bling to them with rhinestones. 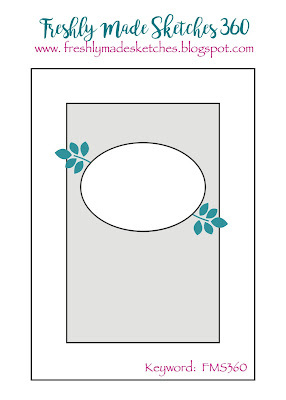 and then a white card stock base. Simple but love all the snowflakes! me this fall in Florida! 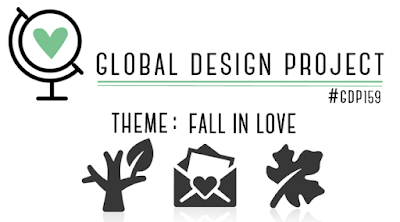 But I can make them happen with the awesome leaves in stamp sets. I used the baby wipe technique to create these falling leaves today. I laid down a few baby wipes to make my "pad." 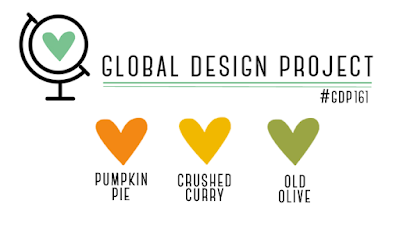 Old Olive, and Crushed Curry. I then used it lie an ink pad to stamp my big and small leaves. 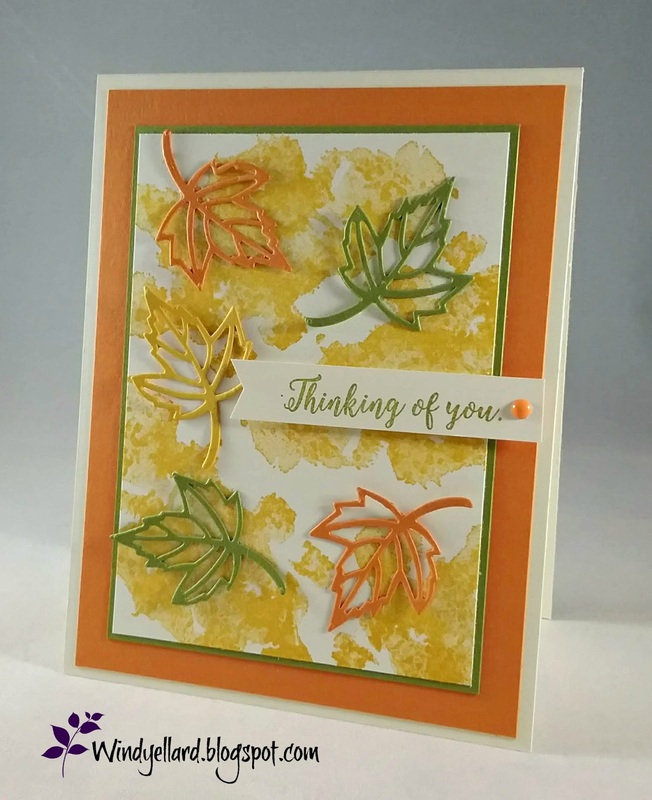 die cut leaves in same color. I finished up the background with three Blackberry dots. and then a Crushed Curry base. Leaves and Leaves and more Leaves! leaves from the Falling For Leaves set. 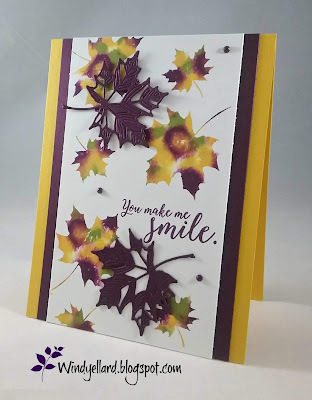 I stamped the leaves in Blackberry Bliss, Mango Melody, and Cajun Craze. with the Timeless Textures set. along with some Blackberry twine. I layered the background on a Cajun base to finish it off. card that I had corner rounder the corners first. I sponged some white craft ink over it to give it some age. I layered it on a Merry Merlot base. in a banner to layer on. I ran some Tranquil Tide trim around and tied a knot. punched it out with the Pretty Label punch. I popped it up on the Soft Suede stitched oval. 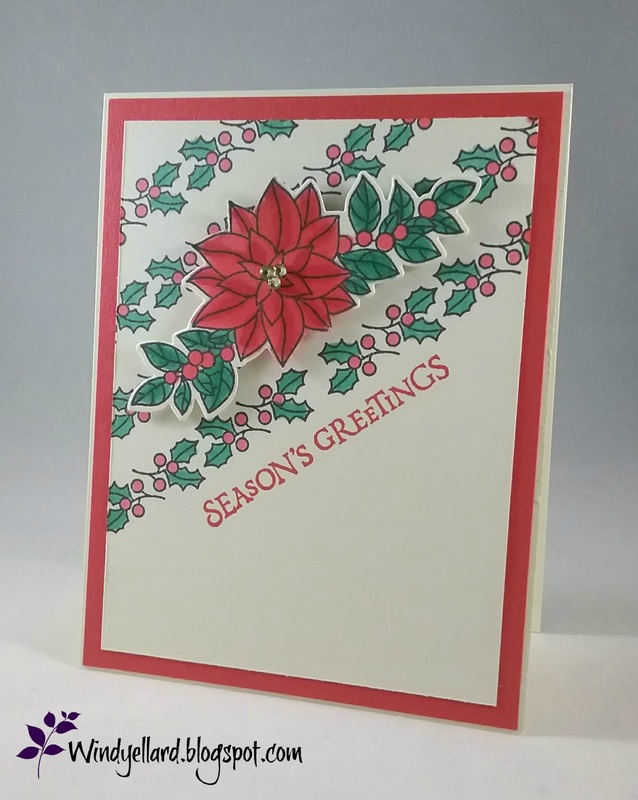 in Merry Merlot ink on the Merry Merlot card stock base. I added some gold thread behind for some texture. 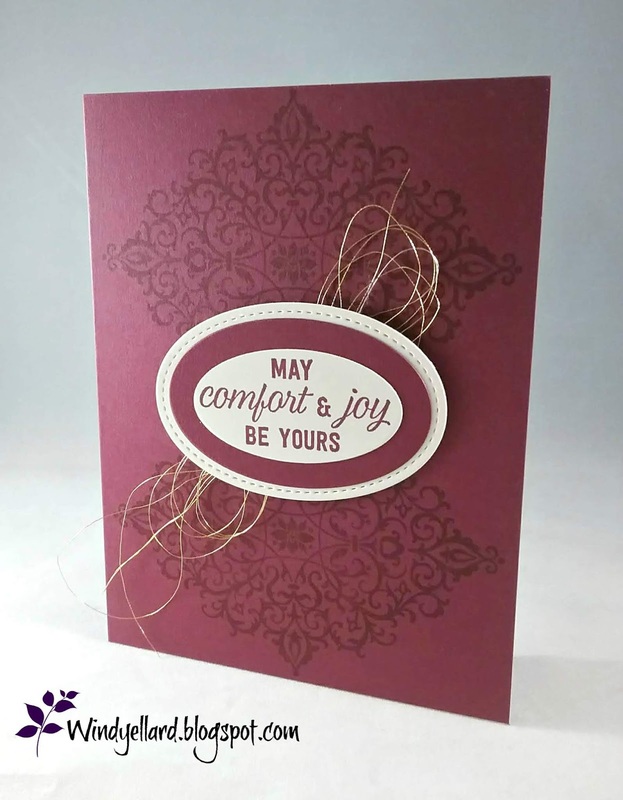 Simple but elegant especially in Merlot. Have a happy Sunday and thanks for stopping by! This is my take on the sketch which might be upside down! I decided a tree was worthy here and it was a chance to use Winter Woods. in Whisper White craft ink. I added the stars from the Hearts Come Home set. 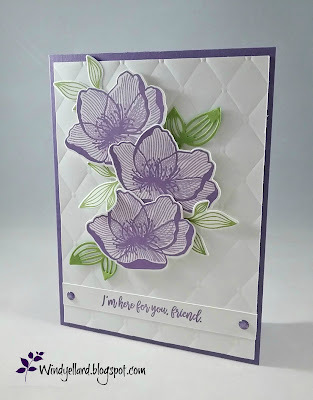 in Whisper White card stock. I added the sentiment from Beautiful Blizzard in Navy to the bottom snow. it looks to clean and crisp like this. I finished it with the white base. 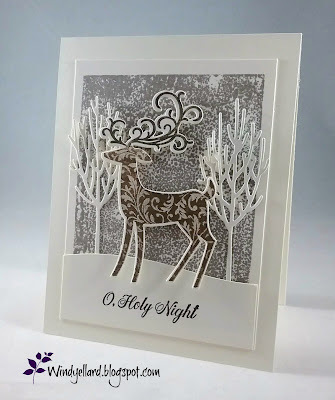 I hope you can see all the shimmer on this card! 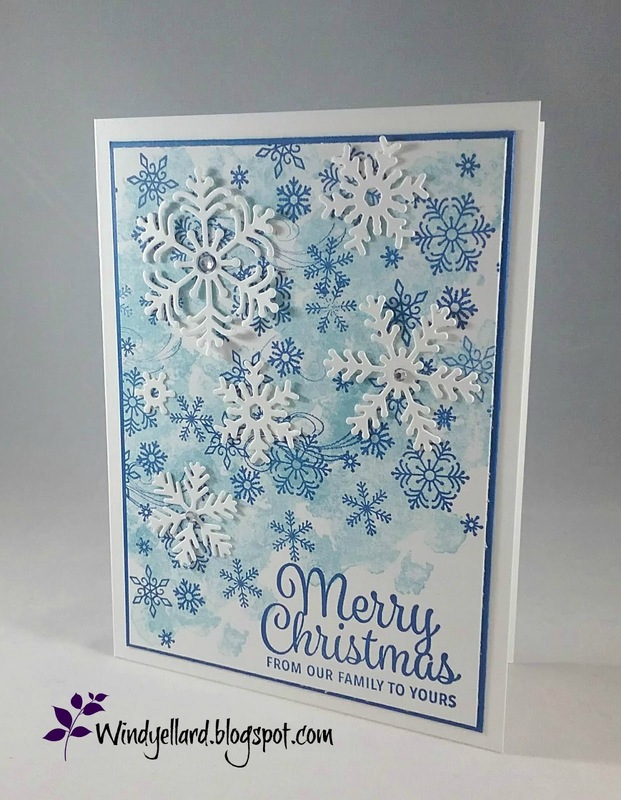 emboss the card stock with the snowflakes. 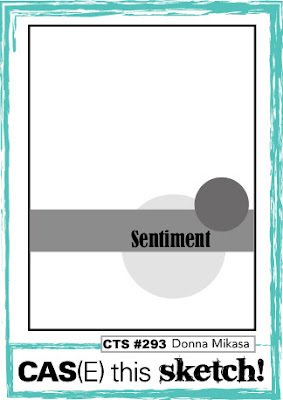 card stock for a great white shimmer. 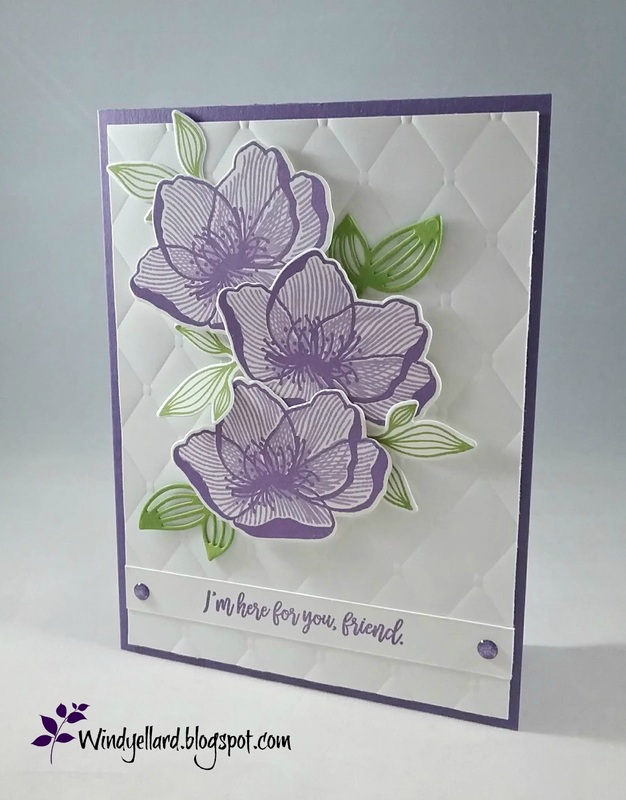 from the Petals & More dies. 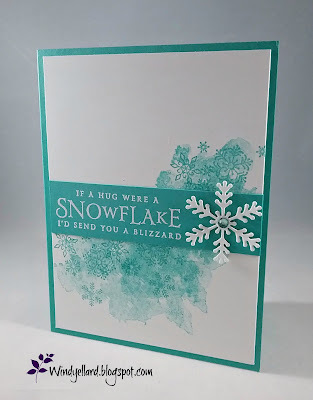 When I saw the sketch, I thought about snowflakes! three times with the copper foil. a new host set called Hung With Care in Merry Merlot ink. on a Merry Merlot base. 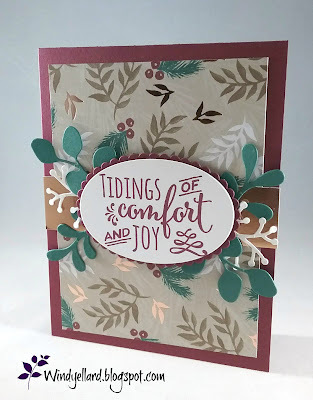 So easy and simple...great layout, too! I like a tic-tac-toe and this one was a good one. 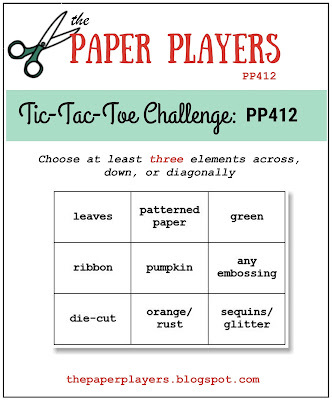 I went diagonal with die cut, pumpkin, and green. there is a sheer lack of them this year. and went to coloring with my Stampin Blends. 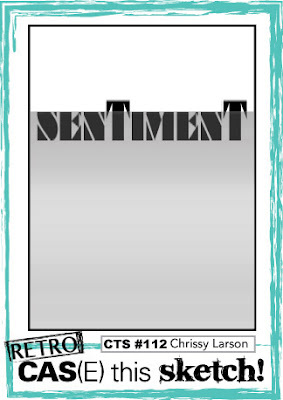 I stamped all the images in Memento Tuxedo Black. on the sunflowers for the green. 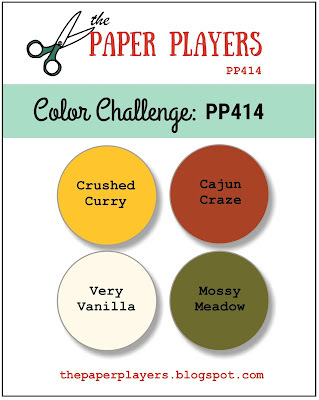 I colored the door in Soft Suede and the mat in Crumb Cake. 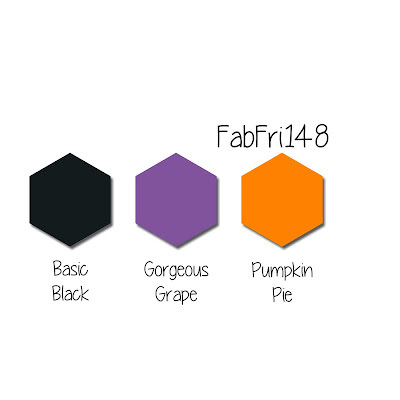 Smoky Slate for the canister and Pumpkin Pie on the pumpkins. I added the Pumpkin Pie for inside the window so it had a fall glow. I used the bronze along with Pumpkin and Ivory for the lantern/candle. and place a piece of Wood Textures DSP then a white base. I like the make a scene and this one has a nice warmth to it. 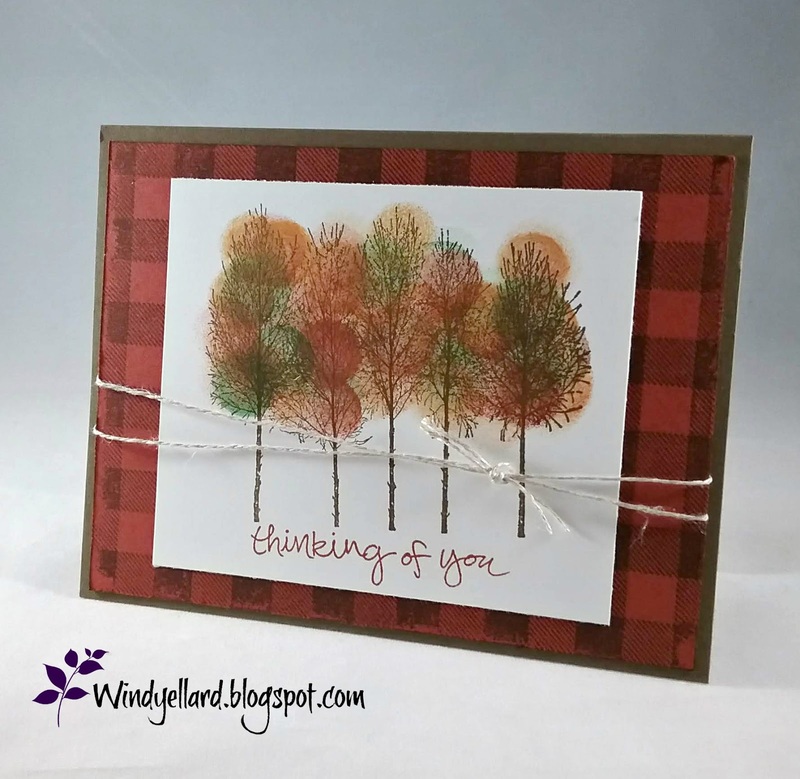 I wanted to make some fall trees with the Winter Woods set. I stamped them in Soft Suede on Whisper White card stock. Call Me Cover, and Crushed Curry inks. 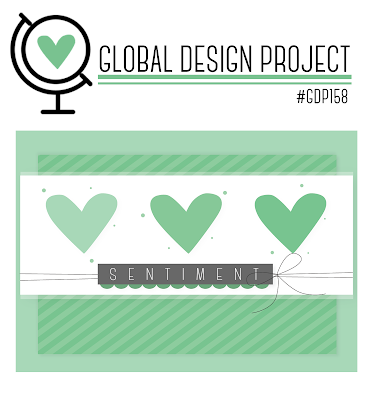 I stamped the sentiment from Sheltering Trees. for the background and layered it on a Soft Suede base. To finish it off, I used some linen thread from a kit to tie around.